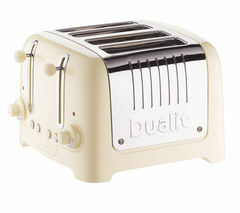 Dualit make classic toasters in a range of styles and sizes. If you’re looking to upgrade your current toaster then a Dualit toaster is ideal. These elegant toasters come in plenty of different colours and designs, so they will complement any kitchen. If you like to start your day off with a nice piece of toast, or if you want to be able to make a tasty snack without any fuss, a Dualit toaster will toast your bread perfectly. Regardless of whether you need to knock up a quick bite to eat before you dash off to work or if you want to grab a late night snack to have in front of the TV, there’s always time for toast. Choose a six slice Dualit toaster if you have a big family who all have breakfast at the same time. You can also get Dualit toasters that do two or four slices at a time. 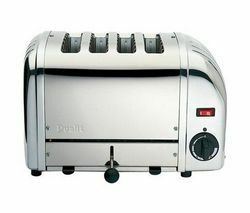 The Dualit 40352 Vario is a 4 slice toaster that comes in stainless steel. It looks good and has extra wide slots so it’s perfect for crumpets and bagels. When you need something to eat that tastes great, but is also quick and easy to make, chuck a slice of bread or two in a Dualit toaster.